Bacteria are often maligned as the causes of human and animal disease (like this one, Leptospira, which causes serious disease in livestock). However, certain bacteria, the actinomycetes, produce antibiotics such as streptomycin and nocardicin; others live symbiotically in the guts of animals (including humans) or elsewhere in their bodies, or on the roots of certain plants, converting nitrogen into a usable form. Bacteria put the tang in yogurt and the sour in sourdough bread; bacteria help to break down dead organic matter; bacteria make up the base of the food web in many environments. Bacteria are of such immense importance because of their extreme flexibility, capacity for rapid growth and reproduction, and great age - the oldest fossils known, nearly 3.5 billion years old, are fossils of bacteria-like organisms. Click on the buttons below to learn more about the Bacteria. 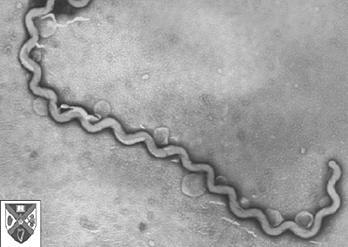 Photograph of Leptospira provided by William A. Ellis of the Queen's University of Belfast. Microbe World, a site maintained by the American Society for Microbiology. The Digital Learning Center for Microbial Ecology, which includes a Microbe Zoo. Bugs In The News, maintained by John C. Brown of the University of Kansas Department of Microbiology, is a set of articles on newsworthy bacteria and other microbes.